Wikipedia - Official discourse in Turkey argues that Children's Day had its origin in Turkey. The Grand National Assembly of Turkey was established on 1920, April 23, and to commemorate the event, April 23 was proclaimed a national holiday in 1921. 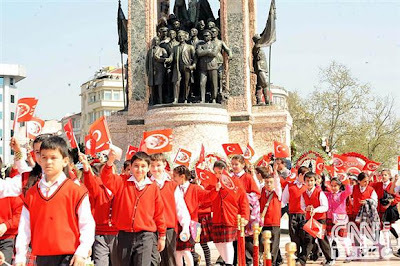 (The founder of The Republic of Turkey ,Atatürk, has given this day to the children.) Since 1927 it has also become Children's Day (Turkish: Ulusal Egemenlik ve Çocuk Bayramı, literally "The Holiday of National Sovereignty and Children"), an official holiday dedicated to the children of Turkey and the world. The day is celebrated annually in Turkey with spectacular activities. In addition to holding many domestic celebratory events such as stadium performances, Turkey also houses Children's Day Festival, where groups of children from other countries are invited to participate in the festivities while staying at Turkish families' homes. In some countries, International Children's Festivals are celebrated with children's of different ethnicities such as Italy.